1. 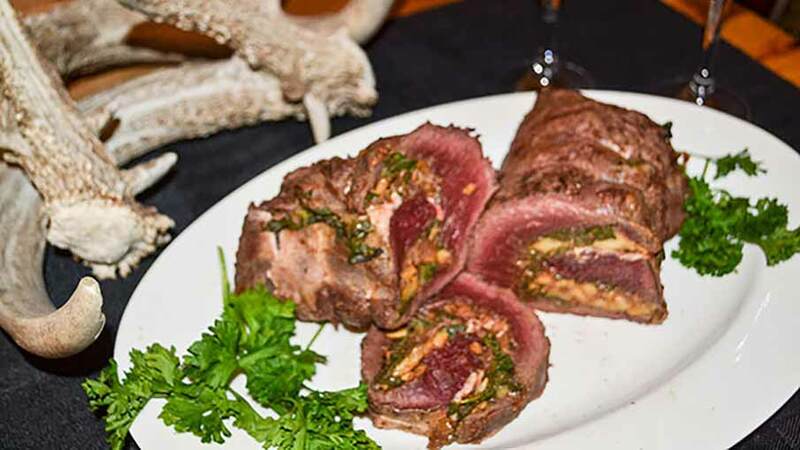 Butterfly elk backstrap down the middle and pound out flat with a mallet. Sprinkle meat with salt and pepper. Then sauté spinach with minced garlic in a little bit of oil. 2. Spread spinach mixture onto the flattened backstrap, then layer with prosciutto and mozzarella cheese. Roll and tuck, roll and tuck to make a log. Truss with cooking twine. 3. Prepare grill, preferably charcoal, until it’s good and hot. Sear each side for about 2 minutes for medium rare or cook until desired doneness is reached. Take off grill and let meat rest for 15 minutes. Slice and enjoy!